The following post is by Julie Blum in Westbrook, CT about the Energy Conservation Program she's running at the local elementary school! At the beginning of February, an “Energy Patrol” for Westbrook’s elementary school kids was initiated, and ever since then, I have been hearing about all kinds of positive reactions to the project. Teachers say that the kids get very excited and enthusiastic about receiving the audit results from the Patrol, and they are reminding everyone to keep turning things off. On their Kids’ News show in the mornings, the fourth graders have made quite a few announcements about the audits; these proclamations help to remind everyone to conserve as well. At the end of the month, the classroom with the best overall audit results received a cute fuzzy white polar bear puppet, which they can keep in their room for all of March (see photo). 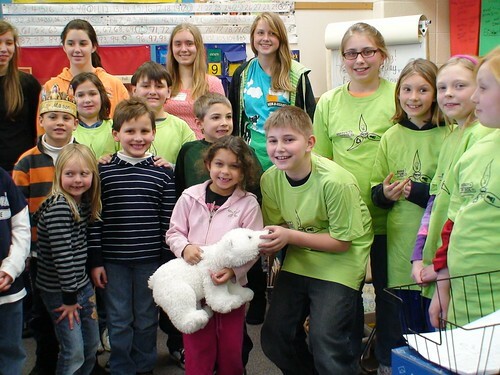 The current members of the Energy Patrol (in the green shirts with the energy patrol logo we created) and some high school volunteers worked together to present the polar bear to the winning class. 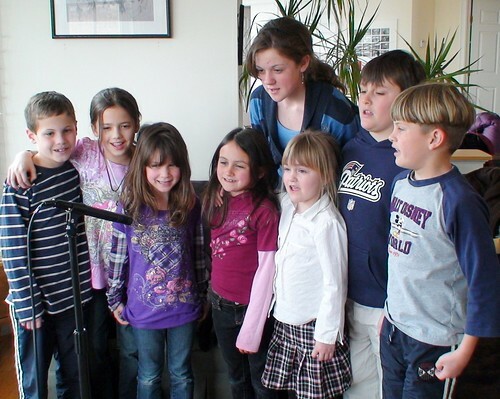 We also recorded a new version of the conservation song I wrote for the elementary school’s launch of the program. We asked some Westbrook kids of all different ages (see photo) to contribute their voices to the recording. After the recording took place, the kids were so eager that they immediately decided to make conservation posters that they could hang around the school and share on Kids’ News. Every classroom in the elementary school will receive a copy of the conservation song, so the kids will be able to enjoy it in their classroom settings as well. At the middle school, another Energy Patrol exists, and the highest scoring grade received a prize as well. Some efforts for other projects are also under way in the high school at this time. Hopefully, a “conservation song” music video involving all kinds of members of our Westbrook community will come into being as soon as possible!